In the weeks following the arrival of the First Fleet in January 1788, Governor Arthur Phillip had already envisaged that Sydney Cove and its environs would, in time, be built in brick. Fast-forward two hundred years and Sydney is just that. Brick buildings, especially homes, are a common sight, and the material is long recognised as an industry ‘old-timer’; a building product that many architects and builders continue to turn to despite the drastic changes in housing styles over the years. Read more about the benefits of bricks. A new public building, however, is set to turn the industry on its head, going against the stock standard brick home design by using the ancient product in a completely new and unconventional way. The first building in Australia to be designed by renowned architect Frank Gehry, the University of Technology, Sydney’s (UTS) Dr Chau Chak Wing Business School has been the talk of the town since plans were unveiled in 2010. As with all iconic buildings, opinions about the design are divided, with some marvelling at the ingenuity of the tree house form, and others dismayed by what’s been dubbed a ‘crumpled paper bag’ façade. But, one thing is certain – the use of bricks on this project has been nothing short of innovative. The UTS building features two distinct external facades, one composed of large, angled sheets of glass to fracture and mirror the image of surrounding buildings, and the other of undulating brick referencing the dignity of Sydney’s urban brick heritage. “The façade of the building will have two aspects and two different personalities. The east facing façade that contains an entry from the UPN is made of a buff coloured brick similar in colour to the Sydney Sandstone,” said Gehry. Easier to describe than create, finding a way to realise this complex structure was a mammoth task for the project team – in 2012, UTS program management director Nigel Oliver told the Sydney Morning Herald that the university and its builder had to first work out “how to lay bricks in keeping with the design of wildly unconventional angles” before the development could progress. Today, construction of the building is almost complete, but this is a feat that would have been impossible without the creation of unique bricks and brick support system. 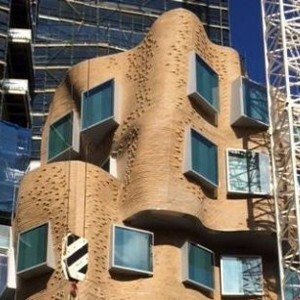 Approximately 320,000 bricks are being used at the UTS building. Custom designed by Gehry and AECOM and manufactured by Austral Bricks, five buff coloured brick ranges were selected following the creation of over 30 different brick façade prototypes across Australia. Each of these pressed bricks, manufactured at the Austral Bricks factory in Bowral, NSW, serve a specific function, and differ from standard brick designs. All brick faces, for example, were required to be visibly appealing as the curved and corbelled nature of the masonry façade reveals the sides, base, top and front of the bricks to view. The ‘K Brick’ is another development. Shaped to appear as though it has been offset from the standard coursing, it assists in creating the required bends and shadowing. A 1/3 bond pattern was adopted for the wall to suit the curved nature of the wall and avoid the lining up of a strong vertical bond pattern. Laying the bricks by hand on site was essential, and a method favoured over the typical brick curtain wall, which would have detracted from Gehry’s curvilinear designs. “The bricks are generally of a standard brick dimension but instead of having the standard indented ‘frog’, they have a continuous slot in the top which enables a continuous stainless steel rod to be inserted to connect the bricks horizontally and to be bedded into the brick continuously,” he says. The backing support system, a concept invented by AECOM, UTS and Austral, has provided a template for the bricklayers to work off in creating the curved geometry without measurement or stringlines. In this way, the geometry of the design was not a problem for the bricklayers, who have been able to build the walls using standard brick and mortar construction. The mortar was specifically engineered by AECOM to be strong and workable to meet project requirements. However, developing bricks that are engineered to suit the façade’s curved and sharp angles was not the only challenge. Before the first brick was able to be laid, the team had to ensure that the overhanging bricks would not fall off – a major hurdle as the brick wall steps out at over 27 degrees in some places. Standard construction with existing available tie systems proved woefully inadequate – mock-up testing had showed that the brick wall would collapse and become unstable after just four courses with wet mortar were applied. Interestingly, the solution to this problem was conceived in the garage of one of AECOM’s directors, who experimented with just bricks and threaded rod. “AECOM developed a tie system from scratch that had never been thought of before, enabling the brick wall to be built traditionally with up to 10 courses of wet mortar (the standard for normal masonry construction),” says Giblett. In this custom ‘groove and bolt’ system, a plate goes on the back of brick when the brickwork corbels in, holding it from falling. Each of the 380,000 bricks used is bolted to a steel frame, and the margin for error is negligible, making the bricklaying job slower than usual. UTS also had to carry out extensive testing of the mortar, ties, bricks and full wall height mock-up panels with load and strain gauges before full scale construction commenced, since there was no existing Code or Standard that accommodated the extreme geometry and construction system the bricks have been subjected to. One test involved sandwiching two bricks together, putting the tie in, waiting for the mortar to set, and then pulling them apart. In another, UTS states that a hydraulic jack has been used to apply as much as 290kg to the structure to test its stability under pressure. “We need to know that when a window cleaner abseils down the building that they’re not going to dislodge any bricks,” said senior project manager Brandon Bell. Yet another success for the team, the system has been allowed to progress beyond Codes of Practice and past projects, enabling a new frontier of masonry construction.